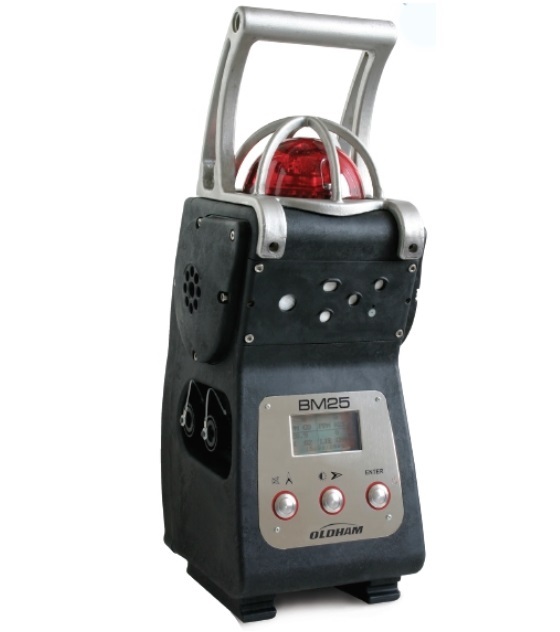 The Oldham BM 25 Transportable Multi-Gas Area Monitor combines the advantages of a fixed gas detection area monitor with the transportable qualities of a portable instrument. The Oldham BM 25 can detect between one and five gases, and is used for applications such as team protection, area surveillance, mobile or temporarily work applications and also locations where a permanent, fixed system is not suitable. Up to 170 hours of continuous running time are possible with the Oldham BM 25, as it is powered by a NiMH battery pack. The Oldham BM 25 monitor also has datalogging capacity of more than four months, as well as STEL and TWA values. The protection of larger areas can be achieved using multiple units, which can be grouped using optional alarm transfer kits. Alarms are transferred from one BM 25 to the next. For long-term area monitoring in classified zones, an intrinsically safe trickle charger is also available. Available as an option, the radio communication allows several BM 25 devices to communicate on the same network or to send information wirelessly to a controller. The network topology used by the BM 25 is a MESH network. In a mesh network all hosts are connected peerto- peer without central hierarchy, thereby forming a net-like structure. Consequently, each node can receive, send and relay data. This prevents having sensitive points, which in case of failure, cut the connection of the network. If a node is down, its goes through another route. Wireless communication is made via a 2.4 GHz radio and emitted power is less than 100 mW. Maximum distance between two communicating devices is 0.6 mile line of sight. Mesh topology allows fast and simple deployment, high coverage versatility and high fault tolerance. It significantly reduces installation and operating costs of networks. These solutions reproduce the architecture of the Internet while optimizing for wireless. The Oldham BM 25 Transportable Multi-Gas Area Monitor is suitable for a wide range of industries including refineries and pharmaceutical production. Applications suitable for the Oldham BM 25 include turnaround work sites, rig overhauls and fence-line surveillance. "Plug-and-Play" Sensors Available: O2, CO, H2S, %LEL, SO2, NO, NO2, HCN, HCl, Cl2, ETO, PH3, AsH3, SiH4, CO2, H2, NH3, PID, XP IR, etc. * The Dual BM 25 Intrinsically Safe Trickle charger which includes an additional IS power module, is required to provide the adequate trickle charge rate and to continuously maintain BM 25 power if using any two of the LEL, IR, PID sensors, OR in the aspirated (pump) version OR in the wireless mode if any one of the LEL, IR, PID sensor.